Jewish tradition teaches us to be like the children of Aaron, seeking peace and pursuing it. In the same vein, it teaches us to expect times of peace and times of war. Does the notion of pursuing peace have to be modified according to the time in which we find ourselves? How do the dynamics of pursuing peace change from one context to the other? What is the role of religions in times of peace and times of war? And how do the dynamics of pursuing peace under different circumstances impact on interfaith relations? Rabbi Fred Morgan was born and raised in the United States and educated in America and England. He was a Lecturer at the University of Bristol in the religions of India before entering the Leo Baeck College in London to retrain as a rabbi. While serving a congregation south of London he also taught at the Leo Baeck College and at Roehampton Institute (now University). 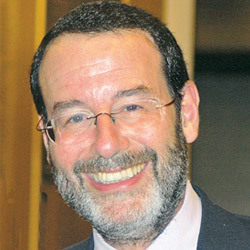 He also served as Hon Associate Rabbi at "Sim Shalom" congregation in Budapest, Hungary. He migrated to Melbourne in 1997 to become Senior Rabbi at Temple Beth Israel, a post he held until his retirement two years ago. Since then he has served as Professorial Fellow at the Australian Catholic University, Coordinator of the Grass Roots Dialogue Project for the Council of Christians and Jews in Victoria, and earlier this year he spent a fortnight in the Philippines as guest speaker with the Sisters of Sion. He has published a number of articles on dialogue and interfaith encounter. He also leads Jewish-themed tours to various parts of the world and has taken groups to Central Europe, India, Spain and Morocco, Eastern Europe, the Kimberley in northern Australia, and most recently the Balkans. In 2014 he received the award of Member in the Order of Australia for his work on behalf of the Jewish community and interfaith relations. Rabbi Morgan is married to Sue, a pastoral carer, and they have three children and one grandchild.